Good vision is more than seeing "20/20". Just because a person can see letters from twenty feet away, doesn’t mean they can use their eyes with the coordination, ease, and proper control required for most everyday challenges - like reading, school work, computer work, and sports! 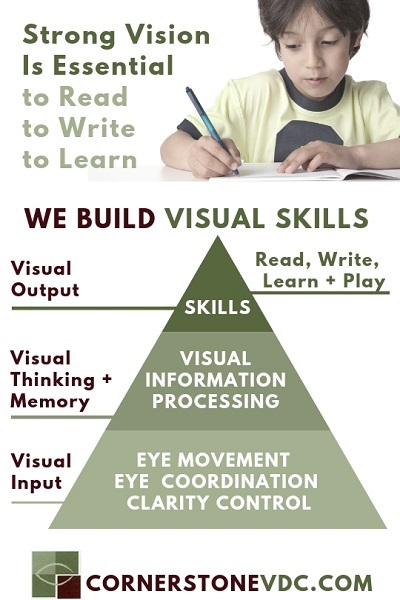 Visual skills are learned. We can teach you. We train your ability to move your eyes together, clear images better, and process visual information more efficiently. Life gets better after vision therapy - reading, computer work, and everyday visual activities become easier and faster. Vision therapy has been prove effective for common vision disorders like Convergence Insufficiency, Amblyopia, and Visual-Processing Disorder. Symptoms from these disorders can make life uncomfortable and learning seem impossible. Once visual skills are developed and learned, life becomes easier and you have the skills forever. We improve your Function Visual Skills (eye tracking, teaming, focusing, visual processing) in office with our trained therapists using proven therapy techniques and at-home with fun and engaging activities. Your vision therapy is prescribed and monitored by our experienced optometrists.